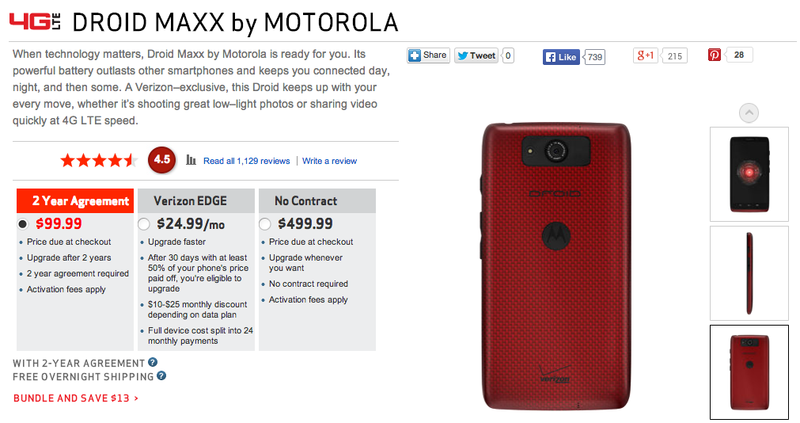 Despite the fact that it’s 2014 and we already are seeing some of this year’s flagships hit the market, you may still be interested in one of Motorola’s 2013 flagships, the DROID MAXX. Though its chief appeal for many is its gigantic battery, there are many other things going for it including Active Display and Touchless Control. Verizon today has announced the addition of two brand new colors, High Gloss Red and Black with Chrome Accents, and this may perhaps push you over the edge to purchase this phone. The two new colors are available on Verizon’s website immediately, priced at $99 on contract or $24.99 per month with Verizon Edge, and they are expected to hit Big Red’s retail shelves starting April 22nd. As a refresher, the DROID MAXX features a 48-hour battery life, 5″ 720p AMOLED display, 10-megapixel rear-facing camera, Motorola X8 Mobile Computing System, and Android 4.4, Kit Kat. You can purchase the device at the link down below.